The main thing hitting our scanners this morning is NFLX, following the company’s post-market earnings report yesterday. Usually when we deal with NFLX, we’re talking about ideas for the stock rising, but today, we’re going bearish on NFLX for a couple of reasons. First, not only did its Q2 revenues fall short of expectations on the street, but the company’s weak subscriber growth numbers are causing worry as well. While this may only be a temporary lapse for NFLX as the company hasn’t made it a habit of misses on consecutive earnings reports in the past, we do want to form a short term bearish idea for the options chain. Secondly, from a technical standpoint, the NFLX chart is exhibiting a strong double top formation. This is not a guarantee that a stock will fall, but is generally taken as a bearish indicator as it suggests trouble with breaking a particular area of resistance. We’re going to tag the NFLX Weekly $365-345 Puts and have them on watch this midweek. 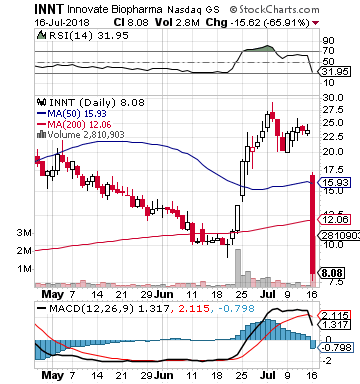 Innovate BioPharmaceuticals, Inc. INNT gapped down hard, and continued to fall even harder yesterday. It may need more than a single session for reversal and rebound, but we’ll definitely want to have it on our radars while it searches out a bottom because the snap-back could be significant. Just last month, as you can see, the stock made an incredible run from less than $10, to nearly $30/share, so the volatility is definitely there. 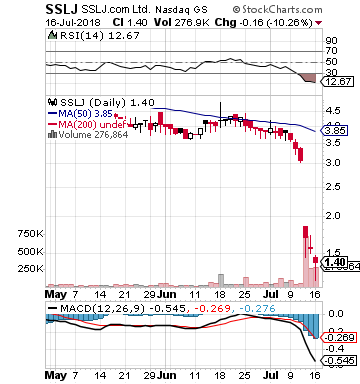 SSLJ.com Ltd. SSLJ is the other bottom-play candidate we’ve ID’ed this morning. It too is currently displaying a chart that is pretty self-explanatory. A recent massive gap-down has lead to a bottoming out, while the stock set new lows yesterday before closing slightly higher. Combine that with an RSI that is indicating a stock which is about as oversold as it gets, and we’re interested in tracking this one for a potential bottom bounce as well. We want to start things off today by looking to take advantage of the big rebound in the markets yesterday. When we want to play the markets as a whole, we generally look to the SPY options chain, and that’s what we’re going to do today as well. We are seeing a significant gap up this morning, and are going to be looking for a classic dip-and-rip scenario due to profit taking. Our targets are going to be the SPY Weekly $264-266 Calls provided that support can hold above this morning’s premarket low of 263.56 on any pullbacks in order to remain interested. 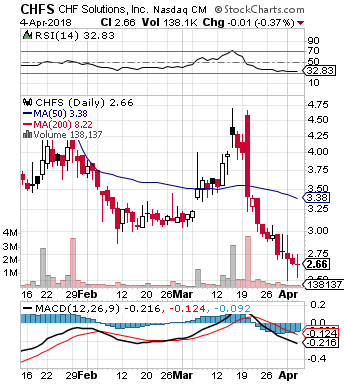 We also want to highlight CHFS this morning as a possible bottom play. 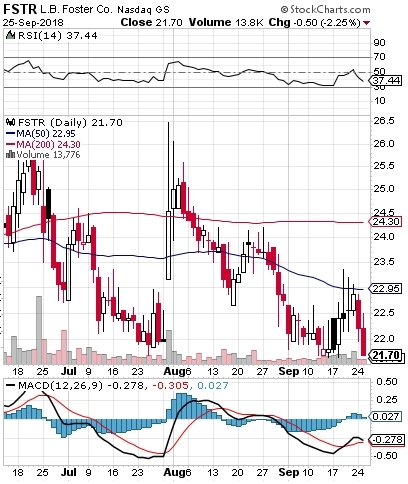 The stock is gapping up in the premarket past its 50DMA, and there is a massive gap on the chart to the upside from just under $5 to just under $8. We’re going to put CHFS, which prior to today had already been approaching heavily oversold territory, on watch over the next few sessions for the possibility of a more sustained rebound. We’re getting a strong bottom bouncer signal from CRON as well this morning, and we wanted to highlight this chart also. 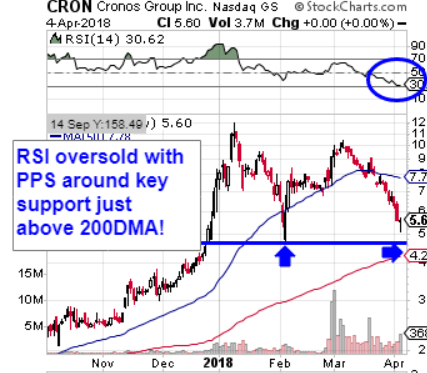 CRON is currently exhibiting most of the things we look for in a bottom play, and we’re excited to see where it could go in the near term, as it looks like there could be some serious upside here.